Midsummer Madness Sale Happening Now – 30% off Everything! From June 20-22, BRW Games is having a sale, with 30% off all of our titles. That’s pdf and hardcopy. 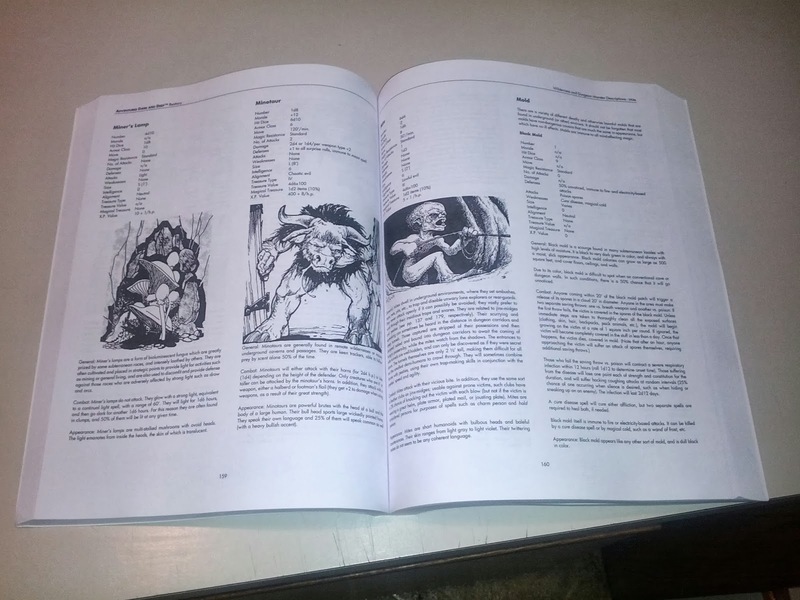 Rulebooks and adventures. Supplements and novels. Everything. If you’ve been holding off getting Castle of the Mad Archmage, now’s your chance. You can get it for under $14 in pdf, and under $25 in hard copy. See the 13+ level megadungeon in all its glory! 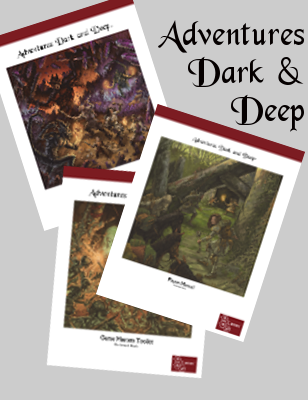 If you’ve been curious about Adventures Dark and Deep, now’s the time to strike. 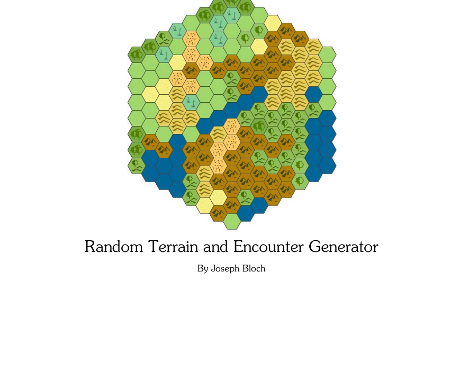 You can get it for under $25 in pdf, and under $50 in hard copy. 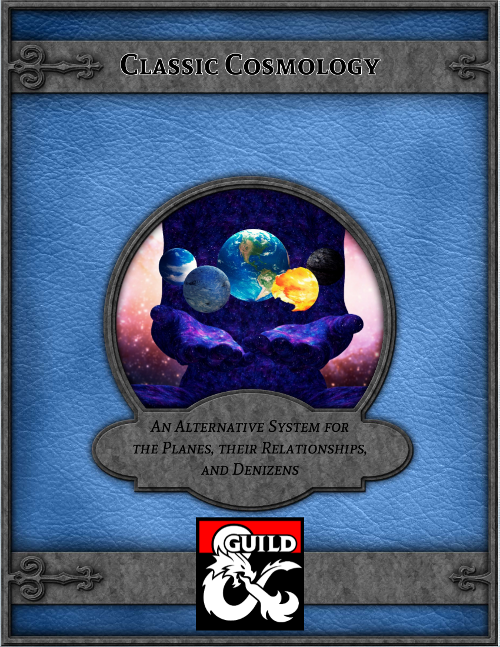 The answer to “What might the game have looked like if Gary Gygax been allowed to keep developing it?” can be yours. But the madness will end soon. Sunday evening. So get them while you can – no telling if We’ll ever do a sale again. It’s an experiment. Click here for the sale! Two very interesting bits of industry news, for those who are inclined to follow such things (like game publishers… ahem). Strickler pointed to board games as one of the community-driven enthusiast areas that the platform has been able to support — noting that as of this week Kickstarter will pass $100 million having been cumulatively pledged to board games. “Last year there was actually more money pledged to board games than video games,” added Strickler. “It’s like $55 million in board games. It’s kind of counterintuitive to the way that we think the world is moving but I think the board game market on Kickstarter is very illustrative of what it is that we actually do. There’s more at the link, of course, including a reiteration of Kickstarter’s intention not to get into the company-equity business. That decision probably has a lot to do with the legal implications; there are all sorts of Federal regulations around such activity, and Kickstarter probably feels it’s just too much trouble and risk. 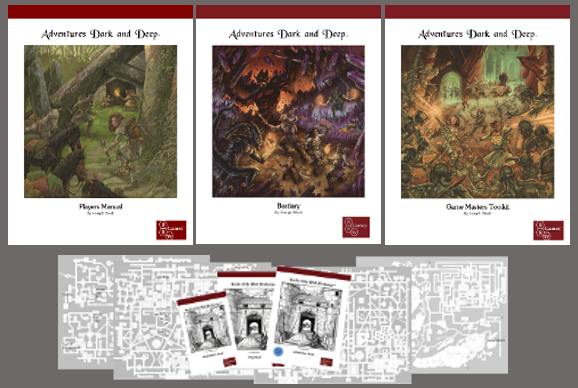 New tools now power the creation of tabletop games — many in the strategy or fantasy genres — from idea to delivery. Crowdfunding sites provide the seed money and offer an early gauge of demand. Machines like 3-D printers can rapidly create figurines, dice and other prototype game pieces. 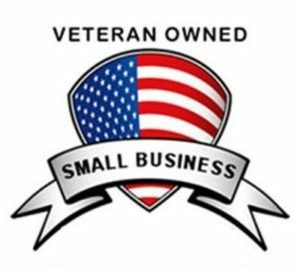 And Amazon, the online retail giant, can handle shipping and distribution, cutting out the need for middlemen. Sales have followed. While the video game business long ago eclipsed its low-tech cousin, sales of tabletop games have continued to grow. … Amazon says board game sales increased by a double-digit percentage from 2012 to 2013. All in all, it’s a great time to be a gamer. And a game publisher. 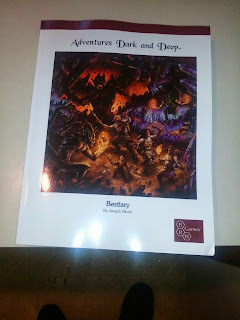 The softcover proof for the Adventures Dark and Deep arrived today. Thusfar I don’t see any real showstoppers, but I haven’t gone through it in detail. 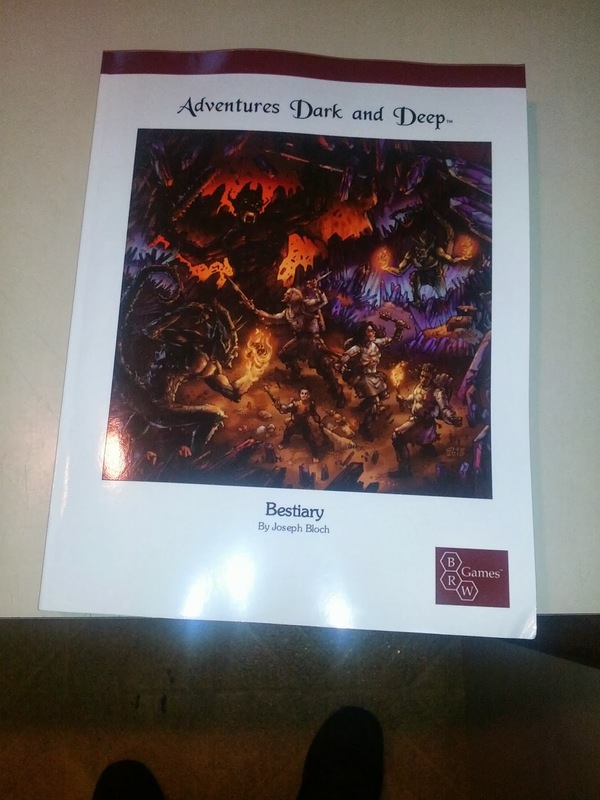 The cover is a little darker than I was expecting, but I want to see how it looks on the hardcover before I start fiddling with settings. That said, this thing is a monster of a book (450 pages) and it is a joy to actually feel its heft in my hands. The art looks gorgeous, and in every way it exceeds my own expectations. The hardcover should come in a week or so – there was an issue with the cover file that caused it to be delayed. 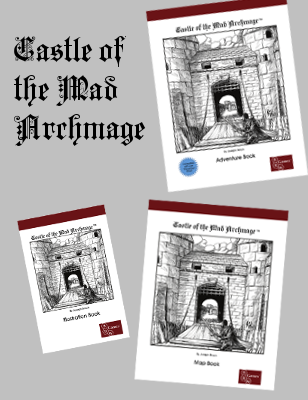 BRW Games is pleased to announce that it will be offering the megadungeon adventure module Castle of the Mad Archmage™ as a published adventure in both print and pdf formats. Castle of the Mad Archmage™ was first serialized as a series of free pdf downloads on the Greyhawk Grognard blog from January 2009 through July 2010, and was an attempt to capture some of the feel of the original Castle Greyhawk, as well as a playable extension of the now-defunct Castle Zagyg line of role-playing aids. The new Castle of the Mad Archmage™ will continue to have the classic “funhouse” megadungeon feel, but will be presented as a complete whole, from the surface ruins through the lowest level of the dungeons, and will be integrated into BRW Games’ forthcoming Fallen Eria Fantasy Setting™, rather than being linked to Greyhawk or another campaign world. (It will still be possible to drop the megadungeon into your own campaign with little, if any, trouble.) 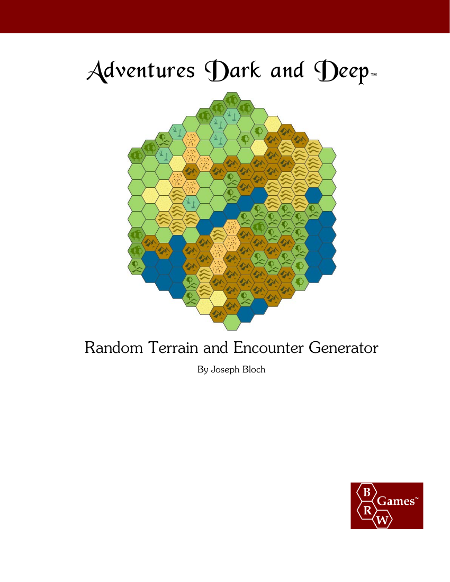 It will be published using the Adventures Dark and Deep™ rules, which means it will be compatible with most OSR-type rules with little or no modification needed. 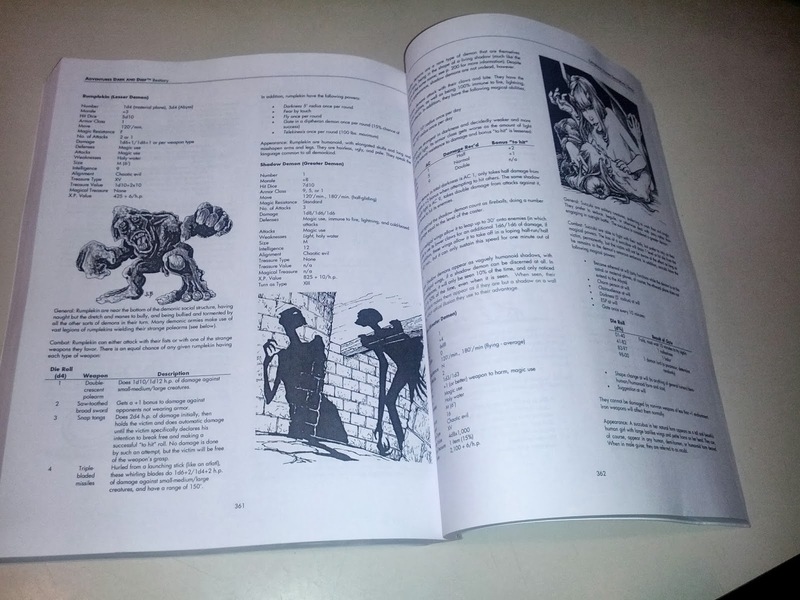 It will also feature extensive annotations to aid the game master in running the sprawling, ever-changing ruins and helping him to get the most out of each level. Castle of the Mad Archmage™ is expected to be available in early 2014. 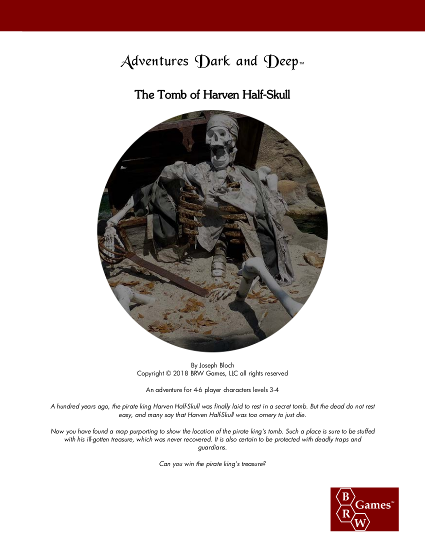 It will be available in pdf, softcover, and hardcover. More details to come!